The weather is holding up well despite the predictions. Today we finished clearing off in Trench 3, which is close to the core of the site, and moved over to Trench 1, which has been set out over the outermost bank and ditch, to continue the process of cleaning down. In the same way as before, all of the topsoil from beneath the sod is sieved in order to make sure we get as many of the finds as possible. It seems that there was less activity at this end of the site as there are generally fewer flint pieces and much less animal bone than in Trench 3. Clearly, different activities were being carried out in different parts of the site. Possible domestic/residential activities were taking place close to the high ground in the centre of the site within the inner enclosures while there seems to have been different kinds of activity elsewhere. Hopefully as we dig further we will get a better sense of what some of these activities were. The surface of Trench 3 was photographed, depths were taken and Kieran and Ailbhe got a start on planning the surface with a 1m square planning frame. This is a tricky process in this trench because of the steepness of the slope: it is not possible to lay the planning frame directly onto the ground surface and the corners have to be propped up to keep it level. The draughtsperson has to take care to look through the frame from directly above in order to accurately record the ground surface. It is a slow laborious process but it is still far better than a photograph because of the amount of detail it captures. Once Trench 1 has been fully cleaned down, it will also be photographed and planned in the same way. 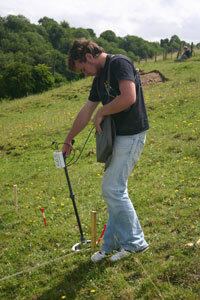 Mark takes a magnetic susceptibility reading using a field loop. We set out another trench, Trench 2, using a total station and we will move into it depending progress in the others. Once this was done, a magnetic susceptibility survey was carried out across the surface using a field instrument (see the Day 2 post for an explanation) and soil samples will be taken as the trench is dug. Using the field loop, care has to be taken to ensure that the loop is as fully in contact with the ground surface as possibly, otherwise an incorrect reading will result. The slab of greywacke at the Rossnaree Enclosure. 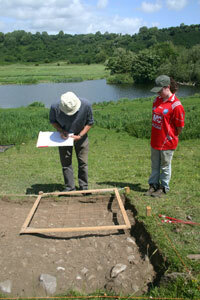 Other work carriedout on site today included setting out the final cutting, Trench 5. This is positioned around a greywacke slab lying half buried in the surface of the pasture field close to the hedge and the plan is to excavate it and lift it. The significance of this stone is this is the stone type that was used for the structural stones in the passage tombs built on the north side of the river. Recent geological work on the structural stones of Newgrange and Knowth has demonstrated that the greywacke slabs used are likely to have been transported to Brú na Bóinne from the coast at Clogher Head, Co. Louth, a distance of c. 20km. This stone is very significant because it is on the south side of the river and it suggests that there may have been a link between those who occupied and used the Rossnaree Enclosure and the builders of the passage tombs. Were both in existence at the same time? 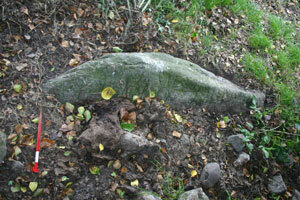 There is also a possibility that there may be art carved on the stone, although none is visible at the moment. Although it is possible that this was part of a passage tomb, there are no other indications that one existed at Rossnaree. It may originally have been a standing stone like similar examples in the land below Newgrange and also at the mouth of the Boyne at Baltray. This entry was posted on July 7, 2010 by Conor Brady. It was filed under Archaeology, Excavation, ireland, neolithic, River Boyne and was tagged with Archaeology, artefacts, Brú na Bóinne, Excavation, flint, Ireland, passage tomb, Rossnaree archaeological dig, Rossnaree dig. Day 18 – Circling the wagons. Day 16 – The pressure’s on. Day 15 – Summer’s back! Day 14 – A ‘soft’ day. Day 13 – Putting our best foot forward. Day 11 – A new week. © Conor Brady and rossnareedig, 2010. Unauthorized use and/or duplication of this material without express and written permission from this blog’s author and/or owner is strictly prohibited. Excerpts, images and links may be used, provided that full and clear credit is given to Conor Brady and rossnareedig with appropriate and specific direction to the original content.